1. Floor or Wall Assembly — Min 4-1/2 in. thick lightweight or normal weight (100-150 pcf) concrete. Wall may also be constructed of any UL Classified Concrete Blocks* . Max diam of circular through opening is 12 in. 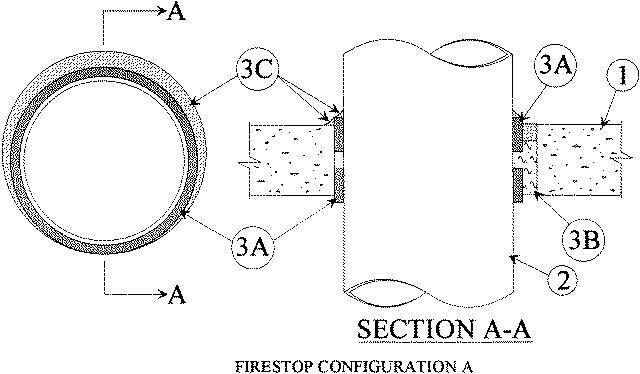 The hourly F Rating is 2 Hr for Firestop Configuration A and 3 Hr for Firestop Configuration B. 2. Aluminum Pipe — Nom 10 in. diam (or smaller) Schedule 10 (or heavier) pipe for use in closed (process or supply) piping system. Max annular space between pipe and edge of through opening not to exceed 1-3/4 in. Min annular space between pipe and edge of opening is 1/4 in. Pipe to be rigidly supported on both sides of floor or wall assembly. A. Fill, Void or Cavity Materials — Wrap Strip — Nom 1/4 in. thick intumescent elastomeric material faced on one side with aluminum foil, supplied in nom 2 in. wide strips. Nom 2 in. wide strip tightly-wrapped around pipe (foil side exposed), secured with a steel wire tie and slid into annular space on both sides of floor or wall assembly. In floors, the bottom edge of the lower wrap strip is to be flush with the bottom surface of floor and the upper wrap strip is to protrude 1/4 in. above the top surface of the floor. In walls, each wrap strip is to protrude 1/4 in. from the wall surface. B. Packing Material — Min 3-1/2 in. thickness of min 4 pcf mineral wool batt insulation firmly packed into opening as a permanent form. Packing material to be recessed from top surface of floor or from both surfaces of wall as required to accommodate the required thickness of caulk fill material (Item 3C). C. Fill, Void or Cavity Materials — Caulk or Sealant — Min 1 in. thickness of fill material applied within annulus, flush with top surface of floor or both surfaces of wall assembly. Min 1/4 in. thickness of caulk also applied to cover exposed edge of wrap strip layer on top surface of floor and on both sides of wall. 3M COMPANY — CP 25WB+ or FB-3000 WT. 2. Aluminum Pipe — Nom 5 in. diam (or smaller) Schedule 10 (or heavier) pipe for use in closed (process or supply) or vented (drain, waste or vent) piping systems. An annular space of min 0 in. (point contact) to max 1-1/2 in. 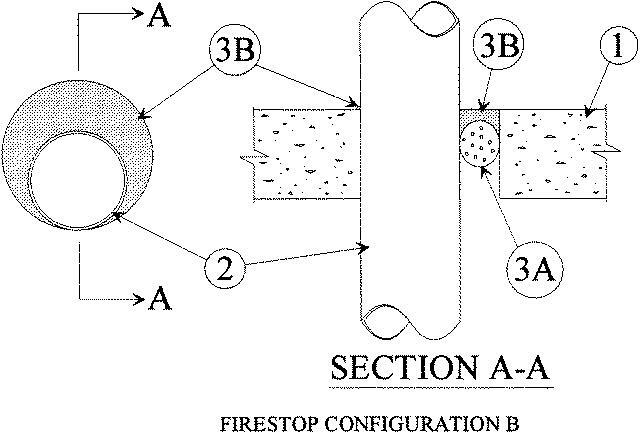 is required withing the firestop system. Pipe to be rigidly supported on both sides of floor or wall assembly. A. Packing Material — Polyethylene backer rod or nom 1 in. thickness of tightly-packed mineral wool batt or glass fiber insulation firmly packed into opening as a permanent form. Packing material to be recessed from top surface of floor or from both surfaces of wall as required to accommodate the required thickness of caulk fill material (Item 3B). B. Fill, Void or Cavity Materials — Caulk, Sealant — Min 1/2 in. thickness of fill material applied within annulus, flush with top surface of floor or both surfaces of wall assembly. At the point contact location between pipe and concrete, a min 1/2 in. diam bead of sealant shall be applied at the concrete/pipe interface on the top surface of floor and on both surfaces of wall assembly. 3M COMPANY — CP25WB+ or FB-3000 WT.